Good morning y’all! The 2014 Winter Olympics are off and running, and as promised, we’ll be providing daily schedules of the rundown of events, highlighting medal rounds and giving you times and TV listings. Sochi, Russia, is nine hours ahead of Eastern Standard Time, so while there are a number of events that you will be able to watch live on NBC and affiliates (they provide thorough real-time coverage on the weekends and some during the week), the network will use its primetime slot (typically beginning at 8 p.m. ET) to re-air the day’s main events via tape-delay. Check out your local TV listings here. For today (Saturday, Feb. 8), there’s a full slate of events, but thankfully the Winter Olympics features a much smaller variety of events than the Summer Games, so the list will be short. Unless otherwise indicated, the listed event time will also be its TV airtime (events slated for tape-delay re-air during primetime will be noted). 12:30 a.m.: Snowboarding, Men’s Slopestyle Semifinals. Americans Chas Guldemond, Ryan Stassel and Sage Kotsenburg compete for a spot in the final later this morning. *5:00 a.m.: Cross-Country Skiing, Women’s Skiathlon 15km (Classic + Free) Final. Americans Liz Stephen, Jessica Diggins, Sadie Bjornsen and Holly Brooks will go for Team USA’s first-ever cross-country skiing medal, though none are expected to seriously contend. *6:30 a.m.: Speedskating, Men’s 5000m Final. Competition in the London Olympics has come to a close, and it was an incredibly entertaining and emotion-packed fortnight of sports. We saw a lot of incredible moments and feats of strength and agility. The London Games were fantastic, and now it’s on to Rio in 2016. Team USA was dominant, winning the most gold and silver and total medals of all participating countries and finishing only to Russia in bronzes. The United States finished with 104 total medals – 46 golds, 29 silvers and 29 bronzes. China was second in the medal standings with 87, followed by Russia with 82, host nation Great Britain with 65 and Germany with 44. Both the U.S. and Great Britain had all-time best Olympic performances. In team sports, Team USA saw fantastic gold achievements in women’s water polo, women’s soccer, women’s and men’s basketball, women’s gymnastics, with a silver finish in women’s volleyball. Team USA swept gold and silver in women’s beach volleyball and the men’s decathlon, the contest of 10 track and field events that traditionally touts the “World’s Greatest Athlete.” So by logic, the U.S. has the two greatest! Fantastic individual performances by Michael Phelps, Ryan Lochte, Missy Franklin, Gabby Douglas, Aly Raisman, Sanya Richards-Ross, Allyson Felix and others netted multiple medals, and feats by shooter Kim Rhode, judo artist Kayla Harrison, wrestler Jordan Burroughs, swimmer Katie Ledecky and others were timeless moments. Diver David Boudia won the first American gold medal in diving in decades. Harrison’s gold was the first EVER in American judo. Team USA extended its dominance in women’s basketball, winning a fifth-straight Olympic gold medal, the men’s team reiterated it intends to remain on top in defending its gold from Beijing, and Misty May-Treanor and Kerri Walsh Jennings completed an incredible run together as teammates, winning a third consecutive gold medal in beach volleyball without ever having lost a match in the Olympics. These were the incredible stories all around that made for an incredible Olympics. Here is a list of all American athletes who medaled in the 2012 Summer Olympic Games in London. Feel free to click their names and learn their stories, see their results and even watch their performances one more time. Note: Athletes who medaled for participating in relay or team qualifying rounds are denoted after semicolons; athletes who participated in medal rounds denoted before semicolons. Well, it’s finally arrived. All good things must come to an end. These last two weeks have been incredibly fun, action-packed and memorable, and I don’t want them to be over. But we’ve got to move on. But, for the final time, I’m proud to bring you the daily slate of events, so you can get your last fix of Olympics action in before we say farewell to London. Basketball is king today, as King James, Kobe Bryant, Kevin Durant and the rest of Team USA look to silence any doubt they can’t handle the size of Spain in the Gold Medal Game, set to tip off at 10 a.m. ET/9 p.m. CT. Spain brings size in Serge Ibaka and Pau and Marc Gasol against the American sharpshooters, whose three-happy game plan was too much for Argentina to handle in the semifinals. Track and field closes with the Men’s Marathon, in which three American men are competing. We also have two Americans each in the women’s Modern Pentathlon, men’s Mountain Bike Race and Men’s Freestyle Wrestling, the last of which begins with elimination rounds and culminates around midday with the bronze and gold medal matches if they advance that far. Team USA also plays one final game in the pool, taking on Australia for bragging rights in the Men’s Water Polo 7th Place Match. The world watches as medals are handed out in men’s water polo, volleyball and handball, and the Men’s Basketball Bronze Medal Match features Russia and Argentina, with both teams featuring NBA talent. For the full slate of medal events, scroll down to the bottom. Rhythmic gymnastics and boxing also close today, but neither event features Team USA. And with that, we bid the 2012 Summer Olympic Games of London adieu! I can’t promise I won’t cry. Closing Ceremonies will be streamed live online at NBCOlympics.com, and they begin at 4 p.m. ET (3 p.m. CT and 1 p.m. Pacific). NBC will indeed air the event in tape delay beginning at 7 p.m. ET and 6 p.m. CT, but the event won’t begin for Pacific audiences until 7 p.m. Pacific time. So just watch it online. Refer here for a way to stream the events live. Yes We Can! Non-Olympic Sports We Need! Watching the BMX races last night got me thinking. While I am actually really enjoying this cycling event, I figured, “Don’t they already have the X Games for this kind of event?” Why have something like this instead of baseball? Then, following that line of thinking, I realize that soccer has the World Cup and tennis has its Grand Slams, and even baseball now has the World Baseball Classic. So I say, why not have BMX racing? The more the merrier really! I’ve got a fever, and the only prescription, is more Olympics. So here are the five sports I think the Olympics really needs to add to the Summer Games slate, and soon! Wondering why golf and rugby aren’t on the list? They’re making their Olympic debuts in 2016 in Rio de Janeiro! Jennie Finch (here), Cat Osterman and others were regular sights on the Olympic softball fields, until this year. Bring them back! Baseball is my favorite sport, and it and softball by proxy are events I looked forward to every four years during the Olympics. It pains me and boggles my mind that these sports were removed from the Summer Games slate following the Beijing Olympics in 2008. They were removed on the basis of a lack of universality. I say that’s ridiculous. Baseball itself has instituted a World Baseball Classic, which is sanctioned by the International Baseball Federation and features teams from around the entire world. The first two years it was played, 2006 and 2009, the Classic was won by Japan, but featured six different teams in the top four final rankings. The United States only placed fourth once, and it was joined in those six by Venezuela, South Korea, the Dominican Republic and Cuba. Baseball is incredibly popular in Southeast Asia, South America and the Caribbean; has international programs in Canada, Italy and Israel; and is featured in places like Australia and the Netherlands, as well. Well, MLB is looking toward adopting HGH blood testing very soon and has already implemented the strictest drug testing program in all of American major sports. Since USA is the birthplace of baseball and the leading force behind the World Baseball Classic, it’s logical to assume the IBF will move to adopt those standards, if it hasn’t already. As for capturing the hearts…please tell me how the Little League World Series doesn’t capture hearts, how perfect games don’t capture the hearts. International programs are working hard to merit inclusion in the World Baseball Classic, which will field 28 teams in 2013. They WANT to play. There is a desire there, and desire doesn’t come from the mind, it comes from the heart. Baseball and softball need to be brought back, now. I’m personally not a huge mixed martial arts fan, but those who are, and the athletes who participate, revere the forms and techniques taught in jiu jitsu. It is the fundamental basis for competition for many MMA athletes. The Olympics already feature taekwondo (a new addition), wrestling, boxing and judo as forms of hand-to-hand or body-to-body combat, why not include one of the other most popular forms in the world? And why not let it make its debut in its home country, at least as an exhibition sport, for a start? Efforts are being made to have this happen, and USA Jiu Jitsu is petitioning to allow it. We shall see. Anníe Mist Thórisdóttir is the two-time defending CrossFit Games Female Champion. Could she and Rich Froning, Jr., the two-time defending male champion, be Olympic gold medalists soon? Even within organized competition, there are what are known as “Weight Room Legends” – tales of vaunted feats of strength within the weight room by players like Alabama’s Trent Richardson, now with the Cleveland Browns. Athletes are known for their epic benchpresses, vertical leaps, curl counts, etc. Why not have them tracked, charted and rewarded on the international stage? Further, with the burgeoning popularity of workout styles like CrossFit, and the introduction of the CrossFit Games, there is already a level of competition and notoriety that comes with victory. CrossFit is also a fast-paced exercise system that challenges the body to move faster, higher and stronger, which are the motto of the Olympic Games. There’s a place for CrossFit on the international stage. If not CrossFit, then at least expand weightlifting to include more typical gym exercises. You got it! Who doesn’t love paintball? It’s fun, fast-paced, intense and actually physically demanding. I challenge you to think otherwise, and then I’ll put you on a course with some of the best shots in the country and see how quickly you run out of breath. I’ve played paintball many a time, and it combines elements of sport that are already exhibited in Olympic play – the agility of canoe/kayaking, diving and gymnastics, the speed of track and field and pentathlon, and the marksmanship and skill of archery and shooting. With all of these combined into the fun and competitive team nature of handball, basketball and soccer, paintball is a perfect fit. One can only dream, but eventually I think there are countries that have athletic body types typical of the football player that can compete on the world stage, if they’re driven to invest in developing a national football program. Football has proven popular in the United Kingdom, and Canada already has a league. There are players from Africa, Europe, the Caribbean and the Pacific islands that play prominent roles on their respective NFL teams. Did you know that there is an International Federation of American Football? The IFAF features 62 member nations, and one of its primary goals is recognition by the International Olympic Committee and inclusion in the Summer Games. The IFAF hosts the IFAF World Championship of American Football, akin to the soccer World Cup, which features eight qualifying countries from the 54 worldwide that field American football teams. So there is international interest, and possibly promise for inclusion in the Olympics. I thought I told you “more is better!” when it comes to Olympics action. Are you telling me I HAVE to pick five sports to replace with the above five? Oh drat. Okay! Here are the five events I’d contract. If you’re going to tell me dancing with a Ribbon Dancer or a Hula Hoop exhibit “Faster, Higher, Stronger” to a greater extent, with a greater following and more emotional attachment than baseball, I am apt to punch you in the face. And I don’t like fighting. While I acknowledge the incredible flexibility and agility of the rhythmic gymnastics competitors, I don’t see how they’ve been included while baseball and softball and golf and rugby haven’t. Women and men alike play all these other sports, while only women compete in this event, and only men in Trampoline (see below). I can’t tell you the last time I saw rhythmic gymnastics on in a sports bar or a restaurant here or in any other country. Sorry, it’s got to go. Again, I don’t reeeeeeeeally want to get rid of anything, and I enjoy the elements of cohesion and athleticism that go into synchronized swimming. But it’s again only an event for women, doesn’t seem to have much of an international following aside from the day or two it gets on primetime every four years and doesn’t tug at the heartstrings. It’s akin to ice dancing and rhythmic gymnastics for me – which are the respective evil stepsisters of figure skating and regular gymnastics, as synch swimming is to regular swimming. They’re beautifully artistic, yes, but do they test athletic resolve and push the human body to the brink? Not so much. Again, don’t want to cut anything, but for baseball’s sake, it’s got to go. It’s great to see athletes who are really well-rounded in all these events – fencing, swimming, riding, running and shooting. But they’re already represented in their own events! We have the heptathlon and decathlon for the world’s greatest athlete designation, we have the triathlon with swimming, biking and running. What’s this all about? More athletes and more countries can compete in paintball, CrossFit and jiu jitsu than the handful of athletes worldwide who take time to train in each individual event. Got to go. Here’s where I”m cheating just a bit. It was down to synchronized diving, badminton and the martial arts already represented being consolidated, but I think weightlifting is the best fit here. We can consolidate judo and taekwondo and even boxing and wrestling to an extent into an all-around Martial Arts category and have them be specific events, much akin to the events in equestrian competition, but there are so many athletes in each weight class that I think it would become cumbersome. So I propose folding weightlifting into the organized exercise I mentioned above, and creating events that complement but preserve the current weightlifting events. This means adding bench press, CrossFit, squats, etc. to the slate of events, without actually deleting anything. American fencer Mariel Zagunis will shoot for her third consecutive Olympic gold medal in saber today. If there is one name in fencing you should know it’s that of saber fencer Mariel Zagunis. A two-time gold medal winner in the 2004 Athens and 2008 Beijing Olympics, Zagunis – who served as the flag bearer for the United States during the London Opening Ceremony – is looking to complete a “hat trick” today in London. Why is she considered “the queen” of U.S. Fencing? When competing in the Athens game in 2004, Zagunis became the first U.S. fencer in 100 years to win an Olympic gold medal, and to win a second gold medal was unheard of for U.S. Fencing. Yet just four years later, she did so. Not to mention her fencing resume is one that would impress anyone. The 2011, 2010, 2009 and 2005 FIE Senior World Cup Champion are just a few titles to name under her belt. 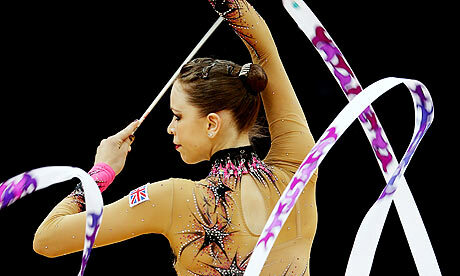 Winning a third time will be tough for Zagunis, as her competition in the saber event is as fierce as she is. She will compete against the current world champion, Sofiya Velikaya of Russia, who actually beat Zagunis last year for the title by one point. Zagunis will also have to deal with Olga Kharlan of the Ukraine, who has been a three-time European champion. Another powerful competitor battling for the gold is four-time African champion Azza Besbes of Tunisia, who was the first African and Arab woman to reach the fencing quarterfinals at the Olympics in 2008. To watch Zagunis battle for the gold medal today, and for all the latest news on the U.S. Fencing team, check out NBC’s fencing page.